Michael McWilliams' exquisitely painted works have the aura of precious collectors' items. This is not only because he decorates antique pieces that are in themselves collectables; cupboards, chests, tables - anything from clocks to cellos really - but because of his meticulous craftsmanship and the distinctive quality of his creative imagination. A number of ingredients come unusually together in McWilliams: he is a fine painter, an animal lover, is knowledgeable about furniture and restores it, and has a witty sense of humour. He has the uncanny ability to select the animals, the setting, the arrangement, that is just right for this piece of furniture. The finely painted realism of these animals - often astonishing - is matched with wit and an elegant sense of design. Each animal has its distinct personality and seems quite naturally to belong to the piece - whether it's magpies playing draughts on a pie-cupboard, plovers guarding a ballot-box or fish serenely swimming across a table-top, watched by a cat. McWilliams generally paints only colonial furniture items in Australian timbers - cedar, blackwood, and kauri ant Huon pine. He knows his antiques, having as a child accompanied his father on buying trips for the antique shop in Longford, Tasmania, of which he is now co-proprietor. In recent years the demand for his work has increased considerably. He has won a number of art awards and his works have been selected for several national exhibitions. 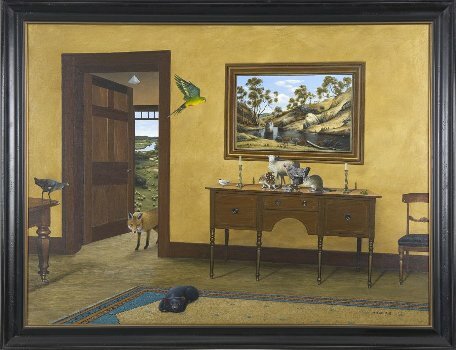 If you haven't previously seen a Michael McWilliams work, at first glance you could be forgiven for thinking you'd stumbled across some undiscovered colonial artist - a William Gould perhaps - for these images of a peaceable kingdom of animals seem to arise from some innocent past, now irretrievably lost. But look again and you'll see that these paintings must be contemporary for only from the perspective of the present do we see that this gentle rural world is, for most of us, a thing of the past. Besides, design elements like the arrangement of forks and crab claw in Crab Attack are clearly contemporary. And furthermore, no colonial artist painted such a range of animals with such affection. Many of the domestic and farm animals are known to him by name; they are portraits of animal friends. Which is not to say that his animal kingdom is all sweetness and light. These works are highly sophisticated and often have an engagingly humorous or occasionally sinister edge. Look at that smug cat sitting proprietorially on a wooden box containing a wattle bird, a silver eye, a sparrow and other birds in Olive's Toy Box. It reminds me of the cat terrifying a caged goldfinch in Hogarth's The Graham Children (1742) which Sir Kenneth Clark described as 'perhaps the greatest cat in art'. McWilliams' cat hasn't yet pounced; it is enjoying the situation, gloating, the way cats do. Occasionally he makes amusing reference to colonial works. In Midnight Snack, a painting of a cow on a meat-safe, the cow is reminiscent of historical stock portraits, which proud owners would commission to commemorate the pedigree of their prize animals. McWilliams' cow, like her historical forebears, is a fine, fat, exaggeratedly large animal - the picture of pastoral perfection. She is even illumined by the golden rays of the setting sun. But she's chewing! Straws of hay protrude from her mouth as she stares out at the viewer, deadpan. So much for traditional bovine dignity. In one of his major works, Sheep at Blackwood Creek, the wide landscape panel of lushly painted bushland has a dream-like quality. At first you see only the sheep - one stares out at you from the foreground creed - but then you notice that the mysterious depths of the bush are alive with animals, among them a possum, a bandicoot, a crow, a night heron and, movingly, for it is now extinct, a Tasmanian Tiger. The irony of sheep dominating the foreground of this Australian arcadia is telling, for the clearing of land for pasture was a major factor in the Tiger's extinction. Michael McWilliams' paintings aren't as innocent as they seem.